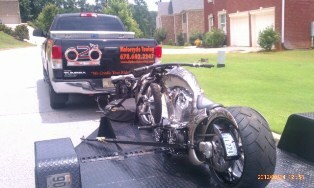 2 Wheels Towing is based out of Lithonia, Georgia. It is a motorcycle towing and transportation company started by Roger L. Pierre. Roger saw an opportunity to provide such a service to satisfy the needs of the motorcycle community in the Greater Atlanta area. 2 Wheels Towing is a full service company that specializes in the towing and transportation of ATV's, Cruisers, Dirt Bikes, Scooters, & Sport Bikes, and is fully licensed and insured. As motorcycle enthusiasts, we understand the importance of having a reliable resource that will guarantee prompt and professional service in the transportation and towing of your bike. 2 Wheels Towing is dedicated to making sure that your bike gets to its destination in the same condition in which it was entrusted to us. 2 Wheels Towing is a member of Motorcycle Towing Services, LC.